Workshop Butler helps you to automate activities before and after workshops. When you create an event, you get a whole set of features to manage attendees. However, you are not able to change their participation status, collect feedback or send follow-ups emails. For that, you need to confirm the event. 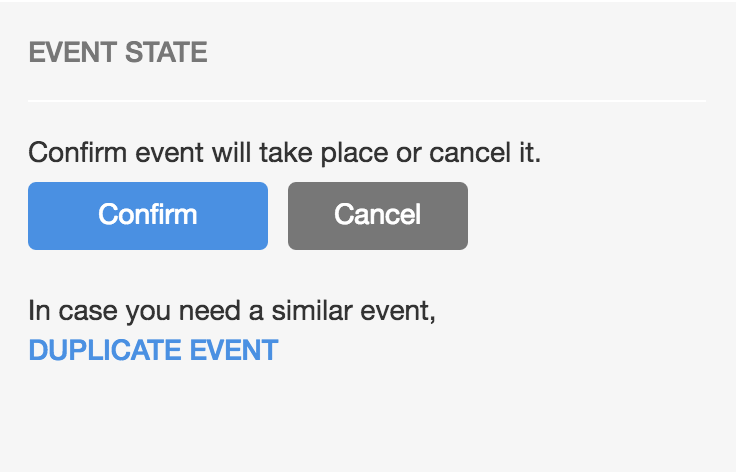 To confirm the event, simply click Confirm button on the Event State tile. When the event is confirmed, the Evaluations tile appears and the attendees can start providing their feedback on the evaluation form. You can also change the status of attendees to Participated after the event is confirmed. Sometimes you are not able to get enough attendees to make the event profitable. The reasonable option, in that case, is to cancel the event. You also don’t pay anything for a cancelled event, according to our principle Pay as you earn. Information about a cancelled event and registered attendees are kept safe in Workshop Butler. You can reach the attendees of a cancelled event anytime and suggest to participate in another training of yours. You cannot cancel an event if it has the attendees with Participated status or with evaluations.